The Quebec-based Orchestre Symphonique de Laval is an orchestra comprising 53 resident players. Although it is a chamber orchestra the string section has sufficient numbers to produce the heady sonorities demanded by Respighi in those full-toned romantic moments that regularly crop up in these scores. 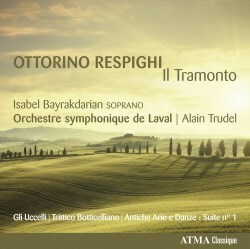 The conductor, Alain Trudel, is a trombone virtuoso and he directs his orchestra with little fuss and considerable musicianship to produce a very satisfying Respighi compilation. Gli Uccelli (The Birds) opens with a lively Prelude, beautifully performed in a glowing acoustic. It doesn’t have the brightness and bite of the classic Dorati version on Mercury but that is mainly due to the mellow sound on this new disc rather than the playing style of Trudel’s orchestra. La Gallina has some delicious over-the-top moments from the bassoons and clarinets, captured with real presence by the engineers. The concluding Il cucu is played with great care and delicacy by the strings and woodwind. There must be a special mention too for the excellent flautist who has a prominent role throughout the suite. The performance of Trittico Botticelliano is also very fine. La Primavera is a glorious movement with its nod in the direction of Debussy. This is a more overtly romantic work than Gli Uccelli and the orchestra plays with enthusiasm and fire. The recording is easy on the ear and below the mellow sheen there is plenty of detail - including bassoon keys clicking away in the highly perfumed L’adorazione dei Magi. The first suite of Antiche Arie e Danze (Ancient Airs and Dances) is up against some stiff competition. I still love the legendary Dorati/Mercury but in terms of recording quality allied to superb playing, Christopher Lyndon-Gee’s CD of the three suites with the Australian Chamber Orchestra is probably still the one to go for (Omega OCD19107 and Artemis Vanguard ATM-CD 1227). If it’s just the first suite that appeals, then this new recording can be welcomed without reservation. Maybe a follow-up disc of the second and third suites could be recorded by the same forces. Finally we come to Il Tramonto (The Sunset) and soprano Isabel Bayrakdarian. She is in terrific voice and her glorious tone is balanced clearly within the rich orchestral textures. This music is in the great traditions of Wagner, Richard Strauss and Korngold. As good as the performances of the orchestral pieces are, Il Tramonto sets the disc apart and I can’t imagine hearing a better performance. It really is a thrilling 15 minutes and deserves top billing. In summary, this is a fine addition to the Respighi discography. The playing is full of atmosphere and energy and the depth of tone in Il Tramonto belies the fact that this is a chamber orchestra. ATMA’s recording is absolutely top class. Lovely disc.